Have you already taken a look at our ready-made cases of lapel pins? Do you want to customize your own unique custom enamel pins? Don’t worry; it is a simple process. Come and put your ideas into action to get your final custom lapel pins! GS-JJ has a powerful Automated Quotation System. Are you worried about how to use the Automated Quotation System? Check out your exclusive guide for the system. 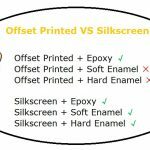 In this guideline, you can learn more about the brief differences in styles and production options as well as the best way to make your custom pins. 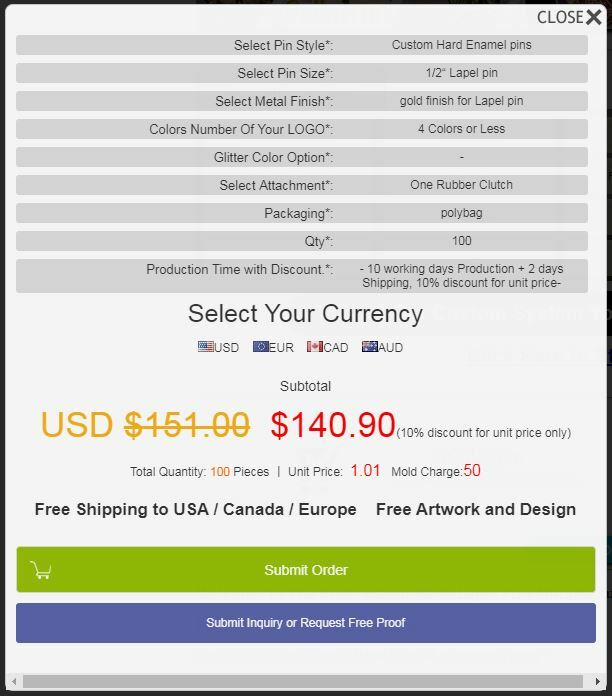 After the above 6 steps finished, payment in time, then the order successfully placed. How to access to the page of the Automated Quotation System (AQS)? 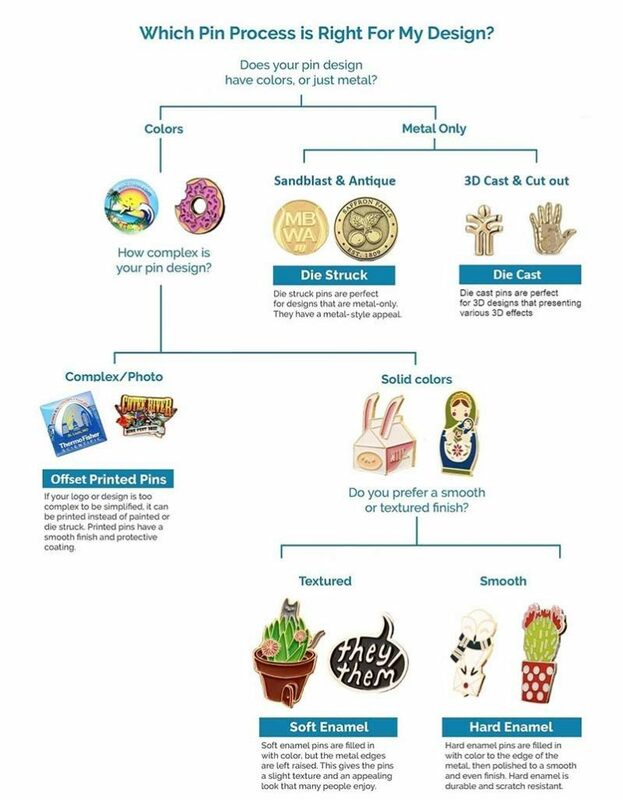 Follow below guide flow called-“Which Pin Process is Right for My Design” to choose the style that fits your design most. If you want to know more detailed information about those 6 styles, please click below links to enter the corresponding introduction pages. Now the system has automatically jumped to the size option with a total of 11 size options. Size is the longest length of the custom pins. As the custom lapel pins can be designed and custom-made in different shapes and sizes. 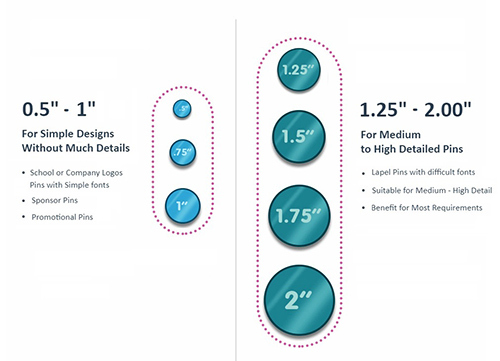 But the most commonly used sizes for custom pins are 1/2 inch, 3/4 inch, 1 inch, 1-1/4 inch, 1-1/2 inch, and 1-3/4 inch. If you have the special request of size, please contact us. The Metal Finish also called the electroplating process is very important for the custom lapel pins. 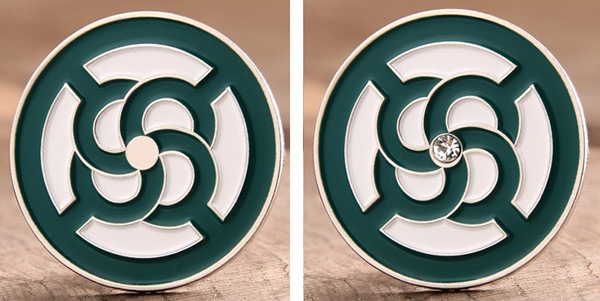 The facade of the lapel pins depends on which kind of plating you chose. The electroplating process refers to the application of metal protective film on the surface of metal raw materials to prevent it from corrosion & oxidation and give the pin an aesthetic appearance and increase its abrasion resistance. We offer all kind of plating options; each has its own unique look. Whether a traditional & colorful look or a classic look from the old world, you are available to choose the most suitable plating for all the occasion for your custom pins. We offer a variety of upgrades to make your custom pins more functional and special. Custom enamel pins are also available with some additional options.GS-JJ can apply Rhinestone, mix in Glitter Colors, add an Epoxy Coating, or even use the glow-in-the-dark enamel paints for your creative lapel pins. Tell us your idea and what you are envisioning, we will, and we are able to help you create and achieve it. 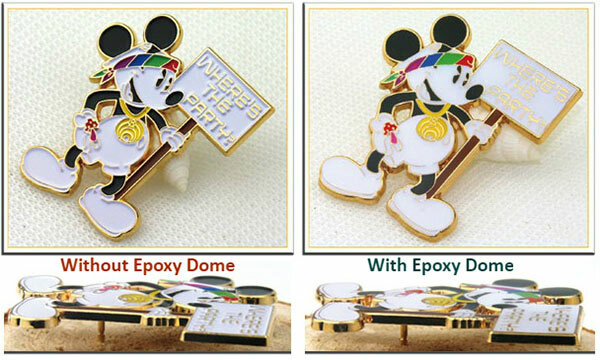 We can add a transparent epoxy resin coating on the surface of soft enamel pins to protect it and give it a smooth surface (lose the sense of concave and convex). Attention: An epoxy coating is usually used for soft enamel, if you want to use for other styles, please let us know. The Attachment option you select will decide how the pin will be attached to your garment and other accessories. Select from several attachment options for your custom pins that best fits it. 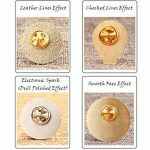 Most pins are attached with the traditional butterfly clutch, but there’s also has a huge range of other options. Here are just 6 commonly used types. If you prefer other non-showed options, contact us directly. 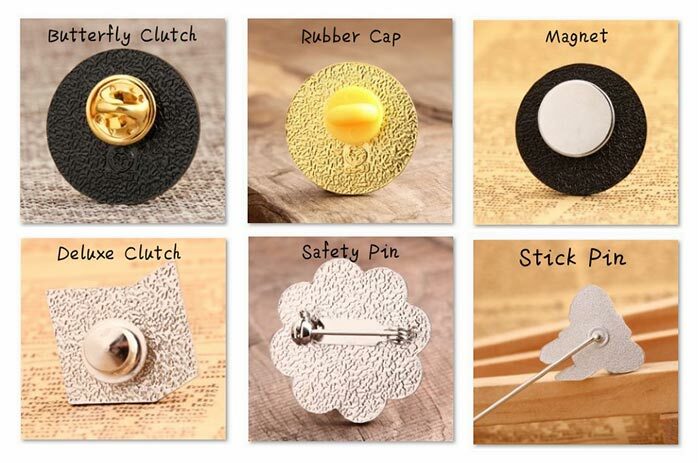 Now, choose a suitable package to make your custom pins stand out. We have four ways of Pin Packaging: Poly Bag, Velour Pouch, Plastic Box, and Velour Box. Except the standard and free Poly Bag, other three ways need to be purchased separately. Noted that these 3 ways need to pay the extra cost and the prices are different in size. The individual Poly Bag is STANDARD and FREE. Our Velour Pouch is the perfect choice when you want to show your custom pins in a special and elegant way. Plastic Box is the cheapest one among the box-packages, and a transparent plastic cover makes your custom pins more intuitive on display. This black Velour Box includes a satin and a velvet pad to hold your custom pins. These exquisite boxes are displaying your custom pins to its audience in a highly elegant and classic way. The production time will start from proof approved. -Without further questions, click Submit Order, go to the next step to fill in your information and upload your design. –Start the journey of customizing your custom pins with an idea, a picture, a sketch or an artwork. GS-JJ offers free design services to help you with any requirements. –Artwork will be created by professional designer from GS-JJ, and then a proof will be sent to you for your confirmation, review and final approval. –Proofs are the best practical way to make sure all the spelling, pattern, styles, colors, sizes and other details are accurate with your approval. –Recommend you to visit our exhibition page to have a look at our ready-made cases to gain more inspiration and idea! You will love our artworks. –Once the design approved, we will create, inspect, and ship your custom pins, with your true satisfaction as GS-JJ’s priority. Finally, we hope that the guidelines will allow you take steps more clear and confident to customize your custom pin order. You can also call: 1-888-864-4755 or email:info@gs-jj.com. 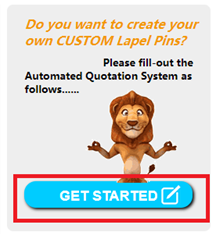 -If you are ready, click below button to get a free quote for your next pin order now! Hey guys, Looks awesome!! Love the way you spelled everything out step by step makes it super easy for the client to make the product. Great Job! Thanks for ones marvelous posting! I actually enjoyed reading it, you will be a great author.I will always bookmark your blog and will come back from now on. I want to encourage that you continue your great writing, have a nice afternoon!